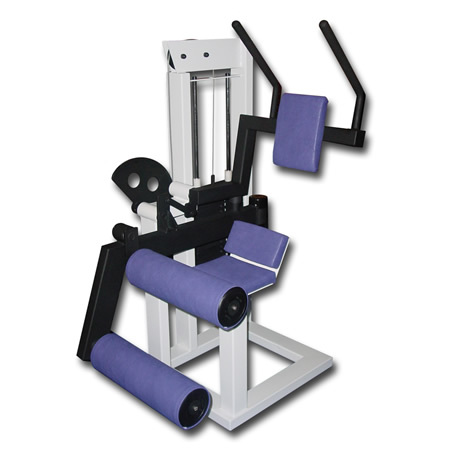 This page is devoted to ab exercise equipment, ab machines, core exercise equipment and abdominal exercise equipment. There are many different tools that you can use to work your ab muscles, and they all have pros and cons. The con of every ab machine is that an ab machine cannot magically melt fat off your stomach. When you use ab machines or abdominal exercise equipment, you will strengthen and develop your ab muscles, but you cannot spot reduce fat from your stomach simply by doing ab exercises. The pro of most ab machines or ab exercise equipment is that they can help to strengthen your ab muscles. Crunches and Sit Ups are the most popular ways to exercise your stomach muscles, but using machines or equipment can add variety to help to keep your body balanced. Machines and equipment can also challenge your muscles in ways the floor cannot. Use ab exercise equipment and ab machines to strengthen your muscles, challenge your body in different ways, and keep your workout fun and interesting. Don't use an ab machine or any ab exercise equipment to magically lose stomach fat. The cheapest piece of equipment is the floor, and it works wonders. No excuses, everyone has one. When I ran track in college, I would work my abs for an entire 30 minute Simpson's episode. You can get a good ab workout just during the commercials of a 30 minute show. 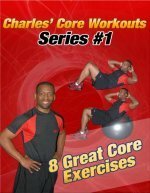 Check out The Directory of Abdominal Exercises to find exercises you can do on the floor. In regards to core exercise equipment, the Rebook Core Board is a great tool to enhance your core workout and engage your core muscles. You can stand on the core board or place your hands on the core board to increase shoulder stability and hip stability while engaging more muscles and burning more calories. Here are a few Reebok Core Board Exercises. The Bosu Ball is a half of a stability ball mounted on a flat rubber platform. It can be used for balance exercises and core exercises. Read more about the Bosu Ball. Other Pages Related to the Bosu Ball. An Ab Roller is not the best abdominal exercise equipment. It can serve a purpose, but I don't recommend that my clients purchase them. If you already have one and like it, keep using it. You can read more about my perspective on using ab rollers during your ab workout. Hanging Leg Raises are a good lower abdominal exercise, but sometimes grip strength can limit the ability to focus on the abdominal muscles. That's when hanging ab straps can come in handy. It's hard to believe companies that sell Electronic Ab Belts are still in business, especially after the Federal Trade Commission filed complaints the 3 Top Companies for making false claims about ab toner belts. Read more about the Ab Belts Scam! 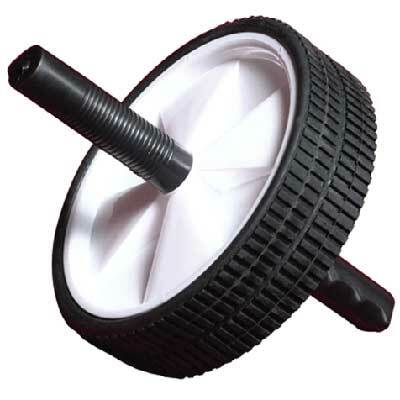 The Ab Wheel or Power Wheel is a relatively inexpensive piece of equipment. Many gyms have them available for there members to use. Check out some of the ab exercises you can do with an Ab Wheel. 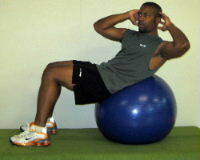 Exercise balls (stability balls) have become a popular piece of exercise equipment in the past years. Because the exercise balls are unstable, they force your ab and lower back muscles to work harder during exercises and can increase your strength, coordination, and stability. The 45 degree slant board is commonly used as a back exercise machine. However, if you turn your body sideways, you can use the 45 degree board as an ab machine and perform oblique exercises on it. Here are 2 variations of an oblique exercise on the slant board. You can add resistance to your ab muscles with cables, dumbbells or ankle weights. When the floor becomes too easy, you can increase the challenge on your ab muscles by adding resistance to your ab exercises. Cables are a great way to add resistance to your core muscles and break strength plateaus. If you're looking for inexpensive abdominal exercise equipment, consider dumbbells. Dumbbells are versatile, easy to store, and don't take up a lot of space. Before spending more than $100 on a bulky ab machine, try a few dumbbell exercises for your abs. Dumbbells are a great way to add resistance to your upper body, and ankle weights are a great way to add resistance to your lower body. Here's a few ab exercises that use ankle weights. Here's my opinion and an overview of the seated ab exercise machine. 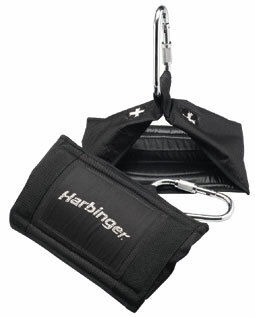 It's one of the most popular pieces of abdominal exercise equipment in major gyms and fitness facilities. 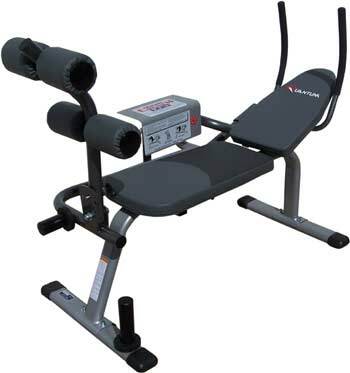 Horizontal Ab Exercise Machines, like the Ab Lounge, all are very similar. They can assist in strengthening your abdominal muscles, but they have some limitations. Read more about horizontal ab exercise machines. I am generally not a fan of as seen on tv ab machines because almost every company lies and uses deceptive marketing techniques to convince people to but their ab machine. Don't be fooled by the slick infomercials and beautiful fitness models. By the way, most as seen on tv ab machine companies hire actors and models to give fake testimonials. The main way that companies try to trick people is by perpetuating the spot reduction myth. The spot reduction myth says that if you work a spot on your body you will reduce the fat at the spot, but that is not how your body works. I have said this many time on this site, but spot reduction is the #1 ab exercise myth. Even the Best ab machines and the best ab exercises cannot magically get rid of stomach fat! So don't buy an ab machine expecting it to get rid of stomach fat. Ab machines and ab exercises can help to strengthen your muscles and keep you fit, and some ab machines can be fun and challenging. If you're board with your current routine and a new gimmick helps you get focused on fitness, then go for it. But use the machine as a small part of a comprehensive fitness program. Remember, despite what clever marketers say, no ab machine or ab exercise equipment can magically get rid of stomach fat or give you 6 pack abs and a flat stomach. Ab machines and different types of ab exercise equipment can help to relieve boredom and strengthen your muscles in different ways then the floor or other types of ab equipment. But not all ab machines are worth the investment. I hope that helps give you some ideas about how to work your abs. 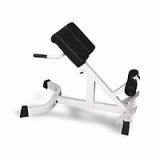 Every week, I try to add more information to this site, so keep checking back to learn more about the best ab machines and the best ab exercise equipment. If you're looking to buy an exercise bike but not sure which brand or model is right for you? Then pay a visit to HomeExerciseBikes.com for extensive reviews of all leading brands of fitness bikes. 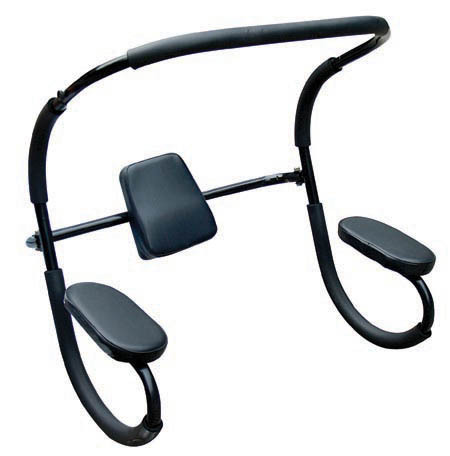 FitnessLyceum.com is a leading retailer of America's leading fitness equipment manufacturers. If you call us we'll give a huge discount on the advertized price - beating the price offered by our competitors.